Our Pre-Primary environment is of a mixed age group from two and a half to six years of age. The classroom is based on the child learning in areas—Practical Life, Sensorial, Language, Mathematic and Culture—having the freedom to choose their work, gently directed by the educator. This freedom within limits enables the child to discover for themselves, allowing them to develop their own skills at the appropriate time. Learning within this nurturing environment, our pre-schoolers grow in both confidence and independence, preparing them for the Primary School. Our Lower Primary consists of mixed age groups of Grade 1, 2 and 3. In order to assist the Lower Primary student move forward with their learning, this part of the school lends itself to the developing imagination of the child. From maths to botany, the student is enriched with the knowledge of his place in the world and encouraged at every turn to ask, research and discover all they can. Through this independent self-discovery, the students prepare themselves for the greater journey of the Upper Primary environment. It is here that the student is working on the adult they are to become. Social graces and etiquettes play an important role as they move into the stage of greater communication and the need for justice. Their minds move to greater abstraction and imagination and their concern for the community becomes greater. This is where their questions are to be answered through their own research and dedication to their own learning. Their enjoyment of project-based work develops both their knowledge and social interactions. Whilst the Montessori curriculum is still followed, the building blocks for an international curriculum are being set in place. 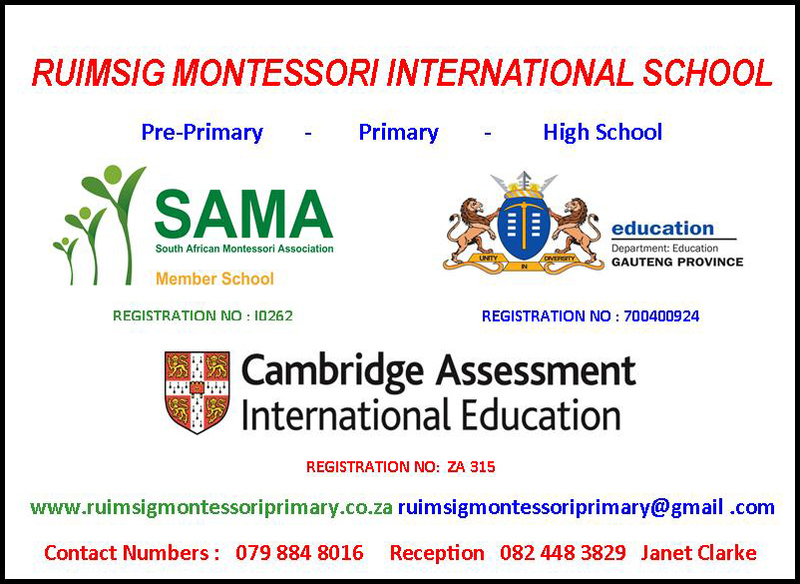 The Ruimsig Montessori International Junior School was launched in January of 2017. The Junior High School phase accommodates Grades 7 8 & 9 students, whilst the Senior phase houses Grades 10 11 & 12. We are a fully registered Cambridge International School and an International Examination Centre.